Evaluation of the worth and quality of a website is done by two major metrics namely Alexa rank and Google PageRank. Normally, you need to go to Alexa website to trace Alexa rank and similarly view Google PageRank using Google toolbar. However, now it is possible to trace the Alexa rank and Google PageRank for a website using “Search Status”, a Firefox plugin. 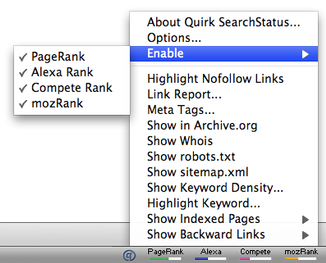 Alexa rank and Google PageRank for a website is displayed by Search Status on the right side of Firefox’s status bar. Once you install this Firefox plugin, you will see Alexa rank, Google PageRank, MozRank, Compete ranking, nofollow highlighting, keyword density, Alexa info, related links info and some other SEO tools. Search Status turns out to be very beneficial to web developers and bloggers. Key features of the Firefox plugin are mentioned below. Displays major metrics such as Alexa rank, Google PageRank, MozRank and Compete ranking. Offers an option for viewing Meta tags and link popularity of a webpage. Emphasizes Nofollow links present on a webpage. Allows checking sitemap.xml and robots.txt of a website in a single click. Site history can be viewed in Whois and Archive.org. Displays keyword density and many other SEO metrics. Offers options for customizing the display. Displays indexed pages along with the backward links for a website.